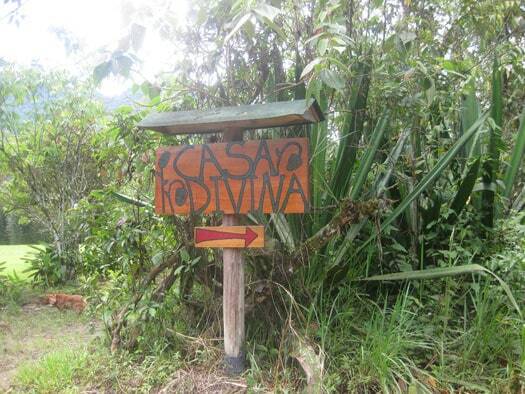 Casa Divina is a cloud forest retreat in the middle of the Ecuadorian jungle near the town of Mindo. It is run by a couple – Molly, who hails from the bay area in Northern California; and Efrain, a Mindo native and lifelong naturalist. They both share a love of nature and work hard to help the Mindo community preserve the cloud forest. They are very aware of the benefits of a sustainable economy, and therefore grow and use local ingredients, and run their lodge in harmony with their surroundings. They have a history of defending the environment (including a battle against the petroleum conglomerate OCP – and helping the local community stop the production of a heavy crude pipeline in 2001), and at the same time are expert hosts, and masters at providing a relaxed and luxurious vacation to their guests. Casa Divina offers three spacious two-story finished wood cabins, each equipped with a private patio with hammock and a full-size bathtub. What makes Casa Divina a five-star cloud forest retreat in our book are the people and the location. Casa Divina is nestled well outside and above the town of Mindo in a cozy cloud forest nook, that is so comfortable and relaxing, you’ll forget you’re in the middle of the wild jungle. At night you’ll hear nothing but the soothing sounds of the jungle sleeping. During the day, if you’re not out and about, you can relax in the hammock on your porch; or, if you prefer, on one of the comfortable beds indoors. From there, you can enjoy the view of the jungle and its many fascinating creatures, flora and fauna, via huge glass pane windows in every room – that give you unobstructed views of the cloud forest. And we should point out that, at the time of this writing, Casa Divina is the only place in Mindo with reliable 24/7 electricity, hot water, and their own septic tanks. Casa Divina is named after Molly and Efrain’s oldest daughter, Divina, a great trail guide on the local property hikes, especially when teamed up with her little sister Sabina (“Sabi”), and an adorable UNO (the card game) fanatic. The two kids are great entertainment after a long days adventure and enjoy showing you around the property, or just relaxing and playing a game of cards. For those that prefer time to themselves, you’ll get it – Molly is excellent at sensing your mood and making your stay comfortable and relaxing. To round out the family are their playful dogs Lilly and Rosy, and of course Paloosa (fingers crossed that I spelled that right 😉 the cat. On one of our local hikes on the property the whole gang accompanied us, creating an unforgettable experience – I felt like we were living in the Jungle Book. One of our favorite things about Casa Divina was looking forward to our end of the day meal in the main lodge, prepared by gourmet chef Molly herself. Using locally sourced ingredients, she would create fantastic three course meals accompanied by our choice of beverage, which included everything from wine and beer, to mixed drinks, juices, teas (you’ve got to try the Horchata tea! ), coffee, and home-made hot chocolate. While you’re relaxing in the main lounge waiting for dinner, with yummy smells coming from the kitchen, Divina and Sabina will no doubt be excited to show you the indoor swings (if you’ve never gotten to swing indoors, I recommend not missing the opportunity!). Overall, our 4 day, 3 night stay at Casa Divina was a wonderful experience. We look forward to returning one day. We were fortunate enough to get the change to stay at Casa Divina last year, and Mindo, for a couple weeks. I have to say that I love this place!! From all the beautiful birds, the laid back people, jaw-droppingly beautiful landscapes, and tantalizingly tasty foods, this to me (short of being on a tropical island) is truly a lost paradise. I’m so thankful for all the eco/ green efforts and am hoping that will continue, and that the Ecuadorian government will not give into the pressure from the oil/ natural resource devils! This type of service is both fun and fascinating. It speaks to several things, among them a cultural movement toward more eco-friendly living, of course. People who stay at a place like Casa Divina will not only have a relaxing and adventurous time in Ecuador, they will also learn so much about sustainability and the possibilities behind eco-friendly living. So much potential! Of course, the cloud forests themselves are an amazing destination no matter where your tastes lie. They are famous for their flying wildlife, from birds of every type to the incredibly colored butterflies that abound in the area. For those of you who don’t know, a cloud forest is a tropical-type forest known for its high levels of moisture. It is also called a fog forest, for the same reason: the entire forest is often misty, especially around the upper levels of the trees, even when it is not actually raining. This effect does several things. First, it creates a very, very wet layer around the tree canopy and its bark, so most of the trees get necessary water through direct contact. This also makes it very easy for moss to grow, since moss needs direct access to moisture in order to propagate. Such forests are often thick with moss on every level. However, the thick cloud layer also darkens much of the floor of the tropical forest. This has its own effect. Without as much access to sunlight, trees tend to be shorter than they are in the more sun-friendly jungles. Groundcover is still present, but it tends to favor the mosses, lichens, and fungi more than vast growth of shrubbery. This has its benefits, as well: some of the most interesting and beautiful plants grow in cloud forests, including orchids. Oddly enough, the water that makes it to the floor of these cloud forests is usually runoff from the trees themselves, which is known as “occult” rainfall and is not actually recorded in precipitation indexes, so the forests receive much more rain than it first appears. Plants in this environment have adopted unique strategies of gaining nutrients with so little sunlight present. Such cloud forests have many of the rarest species of insectivorous plants. They are also animal-rich, with fauna ranging from incredibly unique frogs and lizards to the rare mountain gorilla. Of course, not all is well in the primary cloud forest basins, where uncontrolled land use (such as razing forests for farmland) is a common practice. There is a reason why power and hot water are such rare commodities in the Ecuadorian version of the forests: the areas are largely uninhabited, but as populations grow closer to the cloud forests, the forests are damaged by the ever-popular tea and coffee plantations, as well as harvesting for exotic woods. Some negative effects on the cloud forest are far from local, too. If you do visit Casa Divina, keep in mind that one of the most damaging effects to the forests is from widespread climate change. Even more than most ecosystems, the forests are dependent on a delicate balance. A small change in the climate, and the low-altitude clouds that the forests depend on will start evaporate, leading to less moisture and hotter temperatures that will mean the death for many of the rare species that inhabit the forest. This is turn leads to the death of animals that depend on the dark, moist environment, such as frogs and lizards, along with animals that feed on them. The great thing about projects like Casa Divina is that they encourage the local ecosystem while still allowing people to enjoy the beauty of the cloud forest. I recall a very similar project in Costa Rica, where an entire community was built in the treetops along the same principles. The project in Costa Rica depended very much on solar power to provide its amenities. I wonder if Casa Divina does the same? It seems that might be more difficult in a cloud forest! Of course, there are many alternatives if they are not able to position solar panels high enough for them to be effect. Geothermal power, for example, is a very common alternative and extremely useful for getting hot water and similar benefits that are rare in the middle of the jungle. Or, with a normal town close by, perhaps Casa Divina is able to depend on more traditional types of power usage. I am also curious about transportation around the nearby jungle. Are ramps and solo walks available? The Costa Rica community, I remember, was fond of using zip lines to move from house to house, although this was not practical for everyone there? But still sounded like a lot of fun.